One of the first things I wanted to do was to edit an individual mushroom by selecting it, moving it around, transforming it in a number of ways (rotating it, scaling it), etc. Whereas I expected to see each individual mushroom show up in the Outliner tool (which would then allow me to select a mushroom from the Outliner and see it highlighted in the viewport), I only saw a single "Plane" object in the Outliner. Furthermore, I wasn't able to grab individual mushrooms and do anything with them. They all appeared "locked" into the plane and/or greater model at large. I asked a question on this site and was told that these mushrooms were part of a particle system (which, as a total newbie, I had never heard of before). 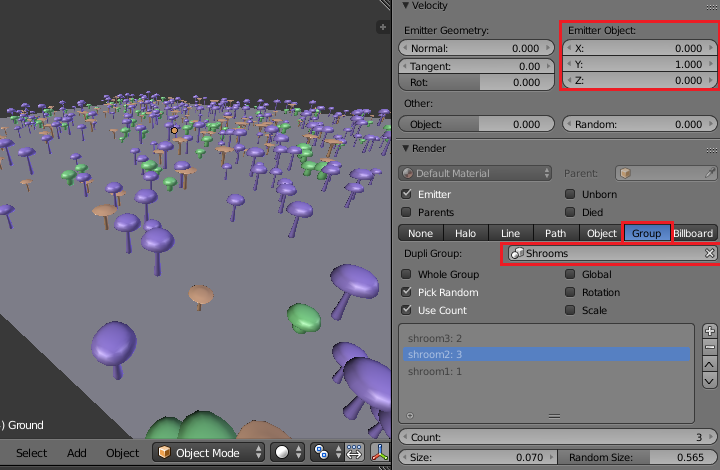 To make the individual mushrooms editable objects, I needed to go to the Modifiers Panel and click the Convert button. I did this, and sure enough, I am now able to edit each individual mushroom. Thank you Blender SE! However, I was curious to find out more about particle systems and how they were related to my mushroom patch. I have now watched several video tutorials on Blender particle systems and emitters, and I'm now totally & utterly confused! How are the individual mushrooms connected to a particle system in the original (on blendswap.com) file? Did the author somehow configure a super customized particle system that "emitted" random mushrooms at random locations? What does Modifiers >> Convert actually do to a particle system (or anything else)? How did it break out all of the mushrooms into separate editable objects? How does it know that the entire mushroom should be the "atomic" editable object, and not allow you to decompose a mushroom into smaller parts (the umbrella, parts of the stem, etc.)? Why were the mushrooms not editable before I clicked this Convert button? How would I convert everything back into a single object (perhaps after editing a few mushrooms), and what would that "single object" be referred to as? I have not downloaded the blendswap file. For this example, I created three different mushrooms. Select ⇧ Shift RMB and group the mushrooms ⎈ CtrlG. Move the mushrooms to a unused layer. Add a plane Ground and add a particle system to it. Set the Start to 0 and End to 1 and the Lifetime the scenes length. Set Physics to No. Starting from frame 1 the particles should not move. Set the initial Velocity to (0, 1, 0) (because my mushrooms face up in direction of Y). Set the Render Type to Group under the Render section. There are more group settings you can use. You now have a particle system which emits mushrooms. You can choose the number of particles (mushrooms) in the Emission tab. Setting the physics to No makes the particles static (not move). Setting the Start and End between 0 and 1 ensures that all particles are emitted before frame 1. Setting Render type to Group shows the group objects instead of other particle display objects. Don't forget to select the correct group. You can also choose object, if you only want to create multiples of a single object. Creating a particle system in the particle tab automatically creates the particle system modifier. You can convert Particle Systems successfully, if their render type is an object or group. The convert button of the particle modifier creates a duplicate object of the object associated with each particle. While there was a shroom1 object at particle X, converting it creates an actual duplicate object linked to shroom1 at the position, rotation, scale of particle X. Particles are defined by the settings in the particle system. (Emitter) Particles can not be edited manually, otherwise the particle settings in the particle system couldn't be executed. Since you can't edit (emitter) particles, there is no way to convert the array of objects back to a particle system after you converted them to individual object. How would I convert everything back into a single object (perhaps after editing a few mushrooms), and what would that "single object" be referred to as? You can't convert the individual objects to a particle system. You can convert them into one mesh, by selecting all and pressing ⎈ CtrlJ. It may be easier to handle a single object (mesh), rather than many different objects (meshes). This would just be practical for editing purposes like selecting all mushrooms when there are many more scene elements. [...] For exporting into a game perhaps as a single file? For game export it usualy shouldn't matter if it is a single object or multiple. The downside of joining (⎈ CtrlJ) all mushrooms objects is that you loose the editing of multiple objects. 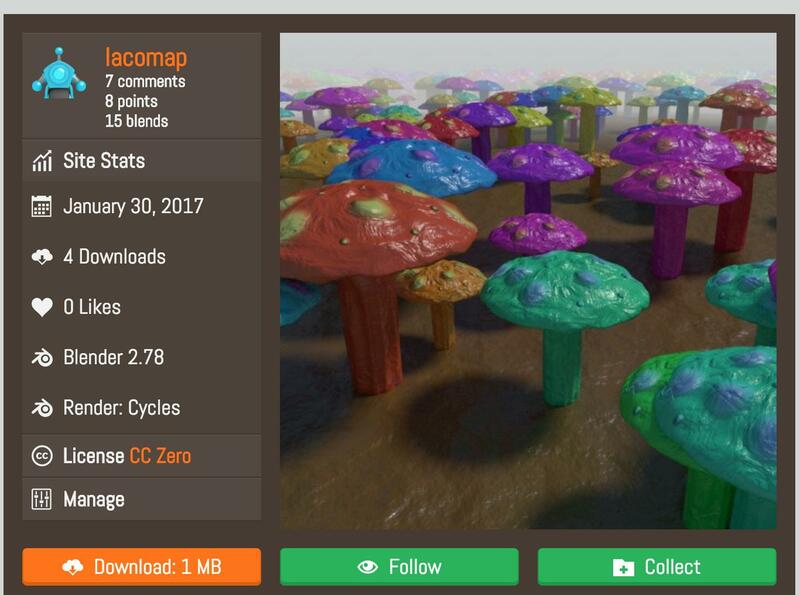 You can no longer edit a single mushroom and all other similiar mushrooms with the same meshdata change accordingly. See Group Instancing as a further example of combining multiple objects into a "single" group object while maintaining editability. Not the answer you're looking for? Browse other questions tagged modifiers particles blend-files . Using a particle with a bit more complex hierarchy? How to give particles systems a moving target (key)? How can I edit textures from linked particle systems? How to make particle systems of particle systems?